Plantar fasciitis is commonly referred to as heel pain, and it affects thousands of Australians daily. In fact, it’s one of the most recurrent foot complaints in the nation. In most cases, sufferers of plantar fasciitis experience sharp and jarring pains in their heels when they first stand up after waking up in the morning. Often, this sharp heel pain becomes milder throughout the day but can be extremely uncomfortable for those who don’t seek plantar fasciitis treatment. what exactly is Plantar Fasciitis?read more..
what is a Heel Spur?read more..
what are the symptoms, why is the pain worse in the morning or after sitting? read more..
what are the main causes of heel pain? read more..
what are the treatment options available? read more..
what can I do myself to ease the pain? 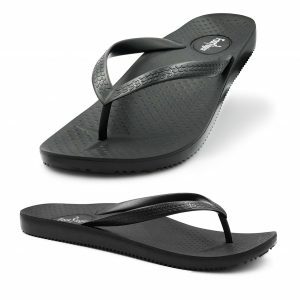 read more..
how do orthotic insoles work? read more..
how do exercises help with Plantar Fasciitis? read more..
what are the risk factors for Plantar Fasciitis? read more..
what research & studies have been done in regards to heel pain? read more.. The term ‘plantar fasciitis’ is Latin for “inflammation of the plantar fascia.” Inside your heel, there is a thick ligament that stretches from your heel bone to your toes under your foot. This fibrous ligament is called the plantar fascia, and its primary function is to act as a natural shock absorber. Essentially, it helps prevent impacts from causing injuries. Because your plantar fascia has limited ability to elongate due to its lack of elasticity, injuries are common. The ligament can tear when you place too much traction on it, leading to inflammation, irritation and painful symptoms. This is what’s known as plantar fasciitis. Unfortunately, plantar fasciitis can last for months or even years if left untreated, though symptoms can start to subside after just a few weeks if you seek treatment for plantar fasciitis pain. Heel spurs are often associated with plantar fasciitis, which is why, if you experience heel pain, you should find a suitable treatment for plantar fasciitis without delay. Our plantar fasciitis foot support has helped relieve painful symptoms for countless people over the years, but there are other treatments available that you might want to discuss with your doctor. If you have a bony growth near the underside of your heel bone, you may have a heel spur (calcaneal spur). Heel spurs often develop when your body responds to the traction that’s caused by your heel bone being pulled away from your plantar fascia ligament. Because the ligament doesn’t stretch, the bone will grow to ‘assist’ your ligament, resulting in a spur. 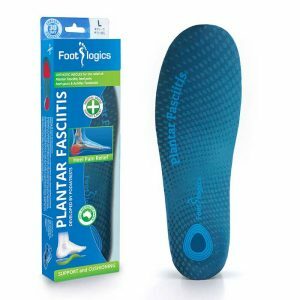 Therefore, a plantar fasciitis heel support can help prevent heel spurs from becoming an issue in the first place. What are the symptoms, why is the pain worse in the morning or after sitting? Usually, plantar fasciitis causes pain near the underside of your heel’s centre. You may experience pain near the sides or front of your heel’s underside. Because our ligaments and muscles tighten and shorten during sleep and while we rest, plantar fasciitis is often most painful when standing up after getting out of bed or sitting down for a long time. When you suddenly place weight on your tightened, irritated ligament, you may feel a stabbing pain because the tissue surrounding the ligament will be extremely sensitive. The right plantar fasciitis support can bear some of the weight placed on your ligament to help relieve pain. To prevent the sudden sharp pain in the morning or after sitting, it is important to give the feet a little warm-up first with some simple exercises. Also, any barefoot walking should be avoided, especially first thing in the morning, as this will damage to the plantar fascia tissue and diminish the effectiveness of your plantar fasciitis treatment. Apart from pain in the heel or foot, symptoms may include a mild swelling under the heel. In addition, heel pain is often associated with tightness in the calf muscles. Tight calf muscles are a major contributing factor to Plantar Fasciitis. An important contributing factor to Plantar Fasciitis is ‘excess pronation’ (or over-pronation). This is a condition whereby the feet roll over, the arches collapse and the foot elongates. This unnatural elongation puts excess strain on the ligaments, muscles and nerves in the foot. When the foot is not properly aligned, the bones unlock and cause the foot to roll inward. With every step taken your foot pronates and elongates, stretching the plantar fascia and causing inflammation and pain at the attachment of the plantar fascia into the heel bone. Re-alignment of the foot should therefore an important part of the treament regime. Cortisone-steroid injections: anti-inflammatories injected into the heel. read more..
Shockwave therapy: ESWT Treatment can be effective. read more..
Accupuncture: this is an alternative treatment method read more..
Trigger-point massage: triggerpoints are tight knots in the muscles read more..
Strassbourg sock and night splint: wearing these at night may help read more.. Surgery: plantar fascia surgery only as a last resort read more..
Are there any plantar fasciitis home treatments? The body is capable of healing itself and can overcome inflammation, provided you give it some rest. Avoid any running, sports, walking distances, walking up or down hills and standing for prolonged periods for at least 6 weeks. Completely avoid any barefoot walking on hard tiles and floors, especially first thing in the morning! Two or three times a day, apply an ice pack directly onto the heel and hold it for 5 to 10 minutes. This will help cool down the inflammation and provide temporary pain relief, and it’s one of the most simple and risk-free forms of plantar fasciitis inflammation treatment. Anti-inflammatory medications like Ibuprofen (found in Nurofen™ and Advil™) will help decrease the inflammation of the plantar fascia. Rapid™ is another nicely potent anti-inflammatory drug and can be helpful for temporary pain relief. Orthotics support the arches and substantially reduce the tension on the plantar fascia, the root of your pain issues. 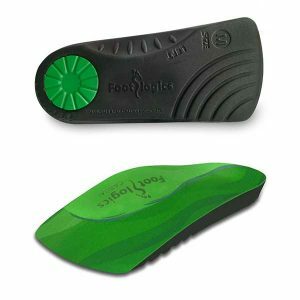 They are designed with a shock-absorbing heel pad, which limits impact on the painful heel, lessening further damage, and increasing comfort. Foot orthotics are commonly prescribed for people with Plantar Fasciitis, giving them the freedom to walk, run, and live their lives as they like. A recent study in Canada proves that orthotics are a beneficial form of Plantar Fasciitis treatment. 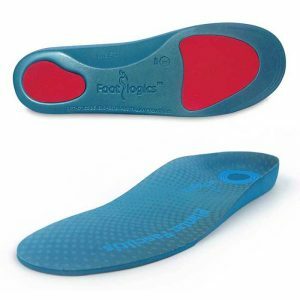 Orthotics are corrective foot devices. They are not the same as soft, spongy, rubber footbeds, gel heel cups etc. Gel and rubber footbeds may cushion the heels and feet, but they do not provide any biomechanical correction. Orthotic insoles provide relief from heel pain and plantar fasciitis by supporting the arches while re-aligning the ankles and lower legs. Most people’s arches look quite normal when sitting or even standing. However, when putting weight on the foot the arches lower, placing added tension on the plantar fascia, leading to inflammation at the heel bone. Orthotics support the arches, which in turn reduces the tension and overwork of the plantar fascia, allowing the inflamed tissue to heal. Orthotics needn’t be expensive, custom-made devices. A comprehensive Heel Pain study by the American Orthopaedic Foot and Ankle Society found that by wearing standard orthotics and doing a number of daily exercises, 95% of patients experienced substantial, lasting pain relief from plantar fasciitis. How do exercises help aid fasciitis treatment? There are some simple daily exercises you can do to help ease heel pain. One of the main causes of plantar fasciitis is tightness in the calf muscles and tightness under the foot. Making the calf muscles longer and more flexible means that there is a less strain placed on the plantar fascia and also the achilles tendons. This is referred to as the Windlass Mechanism. Furthermore the plantar fascia ligament under the foot can become slightly more flexible by doing some simple exercises like the ball roll or towel stretch. Please visit this page for all recommended heel pain exercises. There have been a number of studies in relation to heel pain and plantar fasciitis. The aim of these studies is to find out what treatments are most effective and if the effects are short term or long-term. Cortisone is a powerful anti-inflammatory and when injected directly into the heel it will work almost immediately. Bear in mind however, that the treatment does not address the root cause of the inflammation, and needs to be repeated every few months. Also note, these injections are quite painful, and most doctors today will consider other, less invasive treatment options first. This is not the best treatment for plantar fasciitis unless your symptoms are severe. ESWT (Extra Corporeal Shockwave Treatment). A specialist targets therapeutic shockwaves to the affected heel area. This will stimulate a healing response in the affected tissue and ligaments, resulting in reduced inflammation and pain. 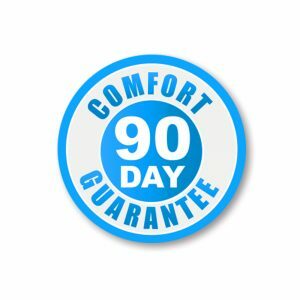 This heel fasciitis treatment and may take from 3 to 4 months to be fully effective. Extracorpreal Shock Wave Therapy is the latest technology to treat chronic plantar fasciitis. It is a non-invasive treatment and highly recommended for people who have tried other treatment like cortisone-injections, acupuncture etc with little or no success. Electroacupuncture and standard acupuncture are used in the treatment of plantar fasciitis and other foot problems such as neuromas and nerve impingement, numbness in the toes etc. In some cases there is nerve entrapment within the foot combined with referred pain from other areas of the body. Some research suggests that acupuncture can be effective in the treatment of heel pain. A trigger point is an irritable knot in the muscle tissue. When pressed trigger points are very tender and can cause pain in that specific spot or elsewhere in the body (referred pain). The response to pushing into the knot is a muscle twitch. The foot contains 126 muscles, tendons and ligaments, so there are plenty of ‘hiding places’ for trigger points. Trigger points in the calf muscles often refer pain directly to the bottom of the foot. Trigger point therapy of the lower leg and foot can therefore be successful in the treatment of plantar fasciitis. The Strassbourg Sock consists of a tubular fabric with two adjustable straps which extends from the toes to the lower leg. The aim is to keep tension on the plantar fascia ligament all night long, so no tightness occurs overnight and little or no pain is experienced in the morning. 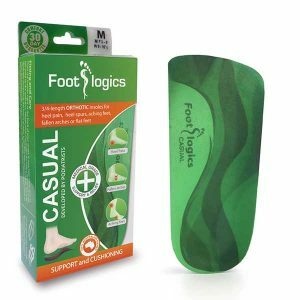 In combination with orthotic insoles and exercises and any other required plantar fasciitis treatment, this device can be very effective indeed. In independent study published in the Journal of Foot and Ankle Surgery found some significant improvement in 55% of the participants. A night splint is very similar to the Strassbourg sock, serving the same purpose. However, this boot-type device is very uncomfortable to wear at night and very cumbersome, this is why most peope prefer wearing the sock. In very rare cases plantar fascia surgery is suggested, as a last resort. In this case the surgeon makes an incision into the ligament, partially cutting the plantar fascia to release it. If a heel spur is present, the surgeon will remove it. Plantar Fasciitis surgery should always be considered the last resort when all the conventional treatments for plantar fasciitis have failed to succeed. Endoscopic plantar fasciotomy (EPF) is a form of surgery whereby two incisions are made around the heel and the ligament is being detached from the heel bone allowing the new ligament to develop in the same place. In some cases the surgeon may decide to remove the heel spur itself, if present. Heel spur surgeries may also do some damage to veins and arteries of your foot that allow blood supply in the area. This will increase the time of recovery.